On July 10, Venus reaches the perfect balance between distance and angle of illumination to shine at its brightest, magnitude -4.7. This is the month to observe the planet Venus at its best. Last week, we saw a close conjunction between Venus and Jupiter, and next week we will see a close conjunction between Venus and the crescent moon. Venus is the brightest object in the night sky other than the sun, the moon and the International Space Station. But the planet is brighter at some times than at others, as a result of orbital dynamics. Venus moves around the sun faster than Earth does, and will pass Earth on Aug. 15. 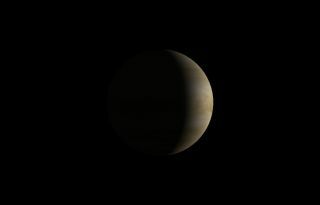 On June 6, Venus was at its greatest elongation east of the sun, exactly 50 percent illuminated. Since then, it has been approaching Earth. As Venus gets closer, it appears larger in size, which makes the planet brighter. But as it begins to pass between us and the sun, Venus is more and more lit from behind, becoming a narrower crescent, and so is also getting dimmer. On Friday, Venus reaches the balance point. Its distance from Earth will be 0.448 astronomical units (42 million miles or 67 million kilometers), its angular diameter will be 37 arc seconds and its disk will be 27 percent illuminated. All these factors combine to give the maximum possible illuminated area, resulting in a magnitude of -4.7 in the upside-down scale astronomers use. By comparison, the sun is magnitude -26.8, and the full moon -12.8. Sirius, the brightest star, is only magnitude -1.4, and Polaris is magnitude +2. The faintest stars we can see are around +6 magnitude. Over the next month, Venus will get closer to Earth, but its illuminated crescent will shrink to a hairline, so its brightness will diminish. The planet will also drop ever closer to the sun at sunset, and become increasingly difficult to see. Most people don’t realize that Venus is the only planet that shows a visible disk in binoculars. At present, even 7-power binoculars will show Venus as a tiny crescent, and the planet will grow visibly larger as it gets closer to the sun. But use extreme caution when looking at Venus in binoculars. Wait until just after sunset, or position yourself so that a chimney or rooftop blocks the sun. Even a fraction of a second viewing the sun with binoculars can permanently damage your vision. Editor's note: If you capture an amazing view of a night-sky sight and would like to share photos with Space.com for a story or gallery, send comments and images in to managing editor Tariq Malik at: spacephotos@space.com.